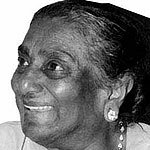 Manonmony Pillay was born in Pretoria, Transvaal (now Gauteng) on 30 November 1908. Her family was originally from the Thanjavur district in India and her maternal grandparents were indentured labourers. Her mother married Govindasamy Pillay, a hawker from Mauritius. They established a business selling fruit and vegetables to hotels. Mononmony was the fifth of nine children and the only daughter. Mononmony married Narainsamy (Naran) Naidoo in 1934. She became known as "Ama" or “Amma” (mother) not only to her children but also to thousands of people in the freedom movement. Mononmony participated in all political activities with her husband and took her children to political meetings and raised them in the spirit of the freedom struggle. In 1947, she was imprisoned during the Indian Passive Resistance Campaign shortly after her husband served four months with hard labour. Three of her brothers went to prison during this Campaign. Mononmony went to prison twice during the Campaign of Defiance against Unjust Laws in1952. She was elected to the executive of the Federation of South African Women (FEDSAW) when it was formed in 1954. She attended the Congress of the People in June 1955, which adopted the Freedom Charter. In 1956, she was among the 20,000 marchers to the Union Buildings in Pretoria to protest against the proposal to institute pass laws for women. In 1963, she marched to the Union Buildings again to protest against the appointment of the South African Indian Council, a puppet body created by the Apartheid regime. When the Transvaal Indian Congress (TIC) was revived in 1983, she was elected Vice-President. Ama and Naran had scant means as her husband, Naran, spent his life fighting for freedom,and they could not provide college education to their children. The situation became desperate in 1945 when Naran had a heart attack and had to give up his job. Ama supported the family by sewing and taking in students as boarders. Nevertheless, Ama’s hospitality - there were always visitors from the freedom movement - was proverbial. The family home on Rocky Street in Doornfontein came to be called "People’s House”. Nelson Mandela was a frequent visitor to this home, as were Walter Sisulu and Moses Kotane. All her five children - Shanthivathie, Indresena, Mithrasagram (Murthie), Ramnie and Premanathan - joined the freedom movement and, as repression increased, they began to suffer vengeful persecution - detention, solitary confinement and torture. It was said that if any mother was to be honoured for heartache during the freedom struggle, she would deserve the gold medal. Despite her agony, she always remained a source of inspiration and strength to her children. “The time is not far away when we will all be back together as one family. I believe I will live to see that day”. When Mandela was in prison and his wife, Winnie Mandela, was being harassed, Ama took care of their children, defying police intimidation, and enrolled them in a Coloured school in Rockie Street. Winnie used to pick them up over the weekends. Zeni and Zindzi Mandela were happy at her home, but police harassed the principal of the school into expelling them before the end of the year as they were not “Coloured people”. Ama and her daughter Shanthie Naidoo were invited by the Government of India for a visit during the Gandhi birthday celebrations and spent two weeks in September - October 1988 in India. They were received by the President, Vice-President and Prime Minister of India. They travelled to Madras and Sabarmati and received a warm welcome. Shanthie, Indres and Ramnie returned to South Africa from exile in 1991, and for the first time since 1963, she had all the children with her. The children arranged a birthday party for her in November 1991, and it was attended by several leaders of the movement, including Walter and Albertina Sisulu, Mac and Zarina Maharaj, Ahmed Kathrada and Helen Joseph. She died on Christmas Day 1993 at the age of eighty-six. One of her most fervent wishes was to see freedom in South Africa and to vote in the first democratic election. She saw freedom, but unfortunately died a few months before the election in April 1994. .. We had a family Christmas dinner at a friend’s house. Mom was there, happy to be with her family, when her heart failed her. She died peacefully later that day.